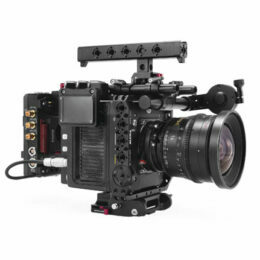 The A1 cage includes Tilta’s own Basic I/O Module that gives your camera setup multiple power, video, and audio in/outputs. The B1 cage includes Tilta’s Advanced I/O Module which is similar to the Basic I/O Module but has more in/outputs and also gives you two XLR inputs so that you use microphones straight into the camera. The C1 cage includes the Tilta Battery Module which directly integrates with the Red V-lock I/O Expander to provide more in/outputs as well as power pass-through throughout your cage, making it ideal for users who already own Red’s own V-lock I/O Expander.